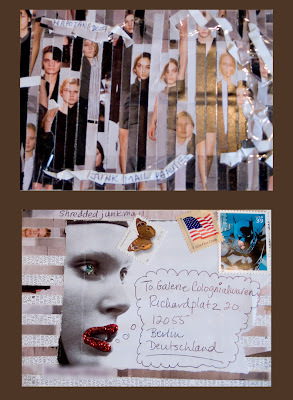 I submitted "Junk Mail Beauties" to a German postcard show called Prosperity in the Rubbish Bin. The card base is a freecard picked up at a movie theatre. It is covered by junk mail that's been shredded and reconstituted. The show is organized by Angi and submissions will be displayed in December at the Gallery Colognialwaren in Berlin. You can think of Mail Art as some sort of exchange of ideas. It’s about creating dialogues between people and expressing experiences of our senses. The purpose of mail art is to abolish distant feelings between people, to show our open minded intentions and to form an international network. Thinking of Mail Art, artists of Rixdorf are working on the topic “Prosperity in the Rubbish Bin”, trying to encourage people to participate. Therefore they are producing postcards or artistic items, postcard-sized. “Art Made From Waste” shall become a creative examination of the item which has been thrown away. It is not just about recycling, thus regaining resources from waste - according to the African idol- but about recovering and about the reinterpretation of materials. Waste – is it a question for our society concerned with issues of living standards? We are disposing, we are recycling, we are sending away all the stuff we don’t need anymore – everything we think useless. The recipient is Africa, one of the poorest continents of the world. It is the main target area for our unwanted things. African artists take this matter on; in the 1990’s they treated the issue as a form of art on its own. They named it “Art de la Récuperation”, in short “Récup”. Récuperation is not just reusing materials; furthermore it is about questioning the matter and reinterpretation. What is more, it is about decryption its ethical and cultural meaning. More than 160 nations are living in Neukölln, a district of Berlin, capital of Germany. There is no day without problems or inharmoniousness on the streets. That is why we would like to cause creative cultural exchanges, talk about matters that move us and more. Galerie Colognialwaren, Richardplatz 20, 12055 Berlin, Deutschland. All work that has been handed in will be shown in an exhibition at the gallery Colognialwaren in Dec 2007. Furthermore you can watch it in the world wide web, surf the internet on www.kulturkiez.de, the official website of artist in Rixdorf! Submit 4”x6” or Size 6 postcards made from recycled materials and reflecting the theme of “Sustaining Our Environment” by January 15, 2008 . On the back of the postcard, provide your name, address and the materials used to make the card. Submissions will be exhibited during the February, 2008 WCA and College Art Association (CAA) annual conferences at Ft. Worth-Dallas, Texas. At the exhibition, works will be auctioned to benefit the United Nations. Documentation on http://wcaartwavesinternational.blogspot.com/. No jury, no fee, no return. 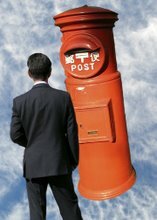 Postal delivery only. 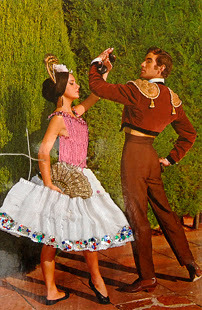 Flamenco card from Postcrosser Bella from NE England. She sewed a pleated skirt, attached glitter and embroidered the bodice. Bella is an environmentalist. A lovely JRR Tolkien stamp of a dragon was affixed on the back of the card. She taught me the slang word "Mint," which means something good. As is this card!